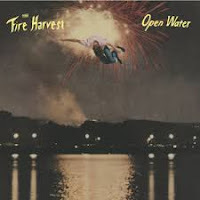 The Fire Harvest debuted on this blog with its second album 'Singing, Dancing, Drinking' over two and a half years ago. The album received a favourable response on this blog (read on here: http://wonomagazine.blogspot.com/2016/05/singing-dancing-drinking-fire-harvest.html). Re-reading my post I notice how darkness is all around everything I wrote. That would be very easy to repeat for Open Water. The album shows some utter darkness as well. Think Neil Young at his most despondent and add just a little more darkness. That is where Open Water starts. Of course a host of Dinosaur Sr. influenced artists from the other side of the pond can be mentioned as well, starting with Bonny 'Prince' Billy. So the mood has been set. If you haven't switched off already, it means that you probably like to wallow in depressive music. Maybe even thrive on it. As that is what The Fire Harvest offers in abundance to its listeners. To be affected by this atmosphere without being personally infected by it. What I notice is that The Fire Harvest takes me on this musical trip past ravines and through deep, dark canyons while showing me breathtaking views in the form of strange rhythmic elements and great guitar parts. Musically there is a lot to enjoy. It is totally clear that this music was not made in a lazy Sunday afternoon. This is the result of meticulous work full of dedication to the desired outcome. I am convinced that only then did the band enter the studio of Michael Feuerstack in Montreal to tape it all in a live setting. The lyrics come forward from stories told and discussions held between the band members while on tour in Germany. Singer/guitarist Gerben Brouwer made these into lyrics, e.g. about a chest given by a grandmother or observations in relationships. His dark voice slowly takes you through the story. The music underscoring the story. Soft drums, a modest bass and guitars that can take a few forms. From pedal steel, to distorted lead notes. Anyone who opens his ears to Open Water will notice the differences in darkness The Fire Harvest presents its listeners with. The level of nostalgia coming with a song. 'Human' is the top song here, with the softly wailing pedal steel guitar. Where the following 'Picture Of A Man' is so much more direct, with its Neil Young solo guitar sound, echoed by a much lighter guitar. Not to speak of the complex rhythm changes that give the song a totally unique sound. Though not easy to follow. It is this level of variation that makes Open Water so interesting to listen to. The Fire Harvest manages to intrigue in an interesting and successful way. It craves listening.